Welcome to the resource centre for AMEC’s new Integrated Evaluation Framework. This new special section of AMEC’s website has been put together to answer the most common challenges and pressures faced by communicators today as they look to prove their value in a rapidly evolving media landscape. Many of the evaluation methods and techniques that the industry took for granted for so many years are no longer enough. As organisational silos are coming down, PR professionals are being asked to work across all forms of media and use, and measure, these new channels and tactics. Work must encompass paid, earned, shared and owned media. To be effective at our jobs, we now need to plan and measure our communications in a truly integrated manner. To prove the value of communication in an age of accountability it is vital to move beyond measuring just the content (or ‘media’) analysis that largely sufficed for the previous 20 years. Now communication professionals must show the effect that their work has had on the objectives of their respective organisations. The interactive element of the integrated evaluation framework will guide you through the process from aligning objectives to establishing a plan, setting targets and then measuring the outputs, outtakes, outcomes and impact of your work. At each step of the process it provides additional information and suggests potential approaches and metrics that might be appropriate. It cannot be an exhaustive list and it doesn’t provide the numbers for you. You will still need to source the data yourself to input into the tool. What it does do is provide a consistent approach to allow you to plan and measure in an appropriate manner. AMEC’s integrated evaluation framework provides a consistent and credible approach that works for organisations of all sizes but which can be tailored to very specific user cases and objectives. Anyone can use it, it is free and non-proprietary, allowing any organisation, be it university, in-house department, PR agency, or measurement company to benefit from its approach. The integrated evaluation framework replaces both AMEC’s previous Valid Metrics and Social Media Measurement Frameworks. The industry now has one integrated approach to the measurement challenges of today. This new framework shows how to ‘operationalise’ the Barcelona Principles and demonstrates how to turn Principles into action, and to finally prove the value of our work. In addition to the framework itself, this site has a number of articles and additional resources to bring measurement to life. This includes an evaluation ‘taxonomy’ which lists and explains for each step of the process the key steps required, the metrics and milestones and the methods that should be considered. My thanks to Professor Jim Macnamara of the University of Technology Sydney for creating this valuable resource and sharing it with the AMEC community. The new framework is a result of a lot of hard work by a lot of people and my sincere thanks are due to them all. For over 6 years, AMEC has been championing a better way of measuring communications with its education initiatives and measurement frameworks. These have helped many agencies and clients improve their measurement and evaluation. But we needed to make a new one fit for the modern complexities of PR and communications. And while we were about it we wanted to make the new framework more user friendly, intuitive and engaging. 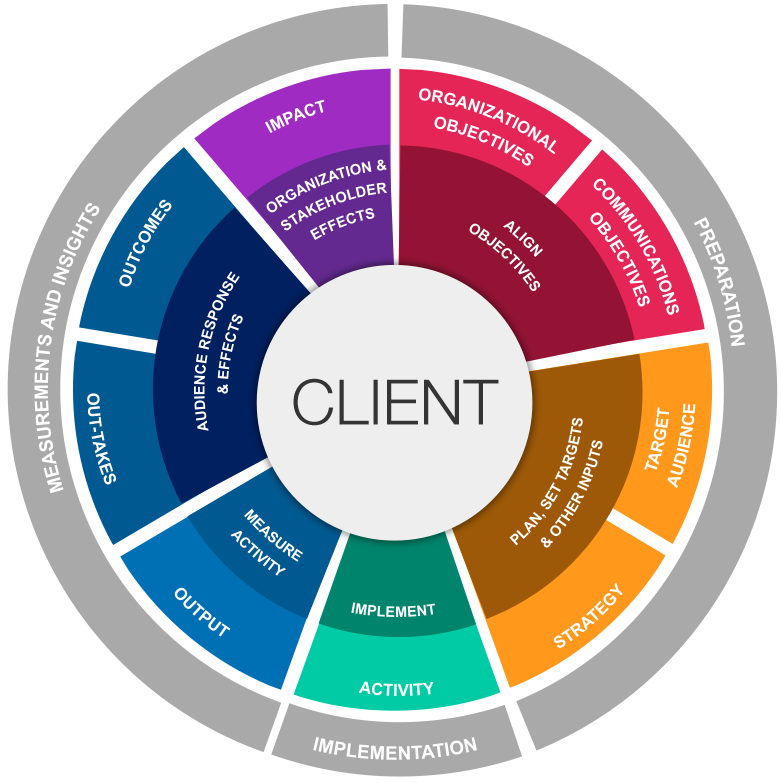 So a working group spanning agency, in-house, market research and academia designed and built the new Interactive Integrated Evaluation Framework. We wanted to make something that took users on a clear measurement journey from planning and setting SMART objectives, defining success, setting targets though to implementation and the measurement and evaluation itself. Importantly, we wanted to find a mechanism that would help credible and meaningful measurement pervade the industry. We have built it in a tile format for a clear step by step process. Each tile is numbered so you know where you are in the process. The journey takes you from organization objectives and communication objectives all the way to business impact. Below we have provided some basic information on how to use it and also show how Lewis PR is using the framework to put our clients at the heart of the process. Like all good measurement, it should start with clear organizational objectives. These can come in many different forms, whether they be awareness, advocacy, adoption or demand related. Following on from organizational objectives, is communication objectives. These should reflect and mirror the organizational objectives. Remember, the difference between an objective and a goal is that an objective has a measure of impact (e.g. 20% increase in brand awareness), compared to a goal that is an aspiration (e.g. increase brand awareness). In outputs, this covers the core measures across PESO. So for example what was the reach of the paid advertising, how many visitors to the website, how many posts, tweets or retweets, how many people attended the event, and how many potential readers of the media coverage. This is quantitative and qualitative measures of outputs. This section covers two important areas. Firstly, to define the target audiences of the campaign. Second, is the strategic plan and other inputs such as describing some of the situation analysis, resources required and budgets. This section is outlining what activities were carried out, any testing or research, content production etc. Importantly, the tool recognizes the importance of paid, earned, shared and owned (PESO) and gives users the ability to tag accordingly. In outtakes, this refers to the response and reactions of your target audiences to the activity. How attentive were they to the content, what was their recall, how well understood is the topic, did the audience engage with the content or did the audience subscribe to more information. In outcomes, this measures the effect of the communications on the target audience. Have the target audience increased understanding, has it changed their attitude to the topic, has it increased trust and/or preference, has it had an impact on the intention to do something (e.g. trial, subscribe, register) or increased online advocacy. This final section is where impact on the organizational objectives is evaluated. So here the tool is looking to cover reputation improvement, relationships improved or established, increase in sales or donations, change in policy, or improved social change. This is a clear demonstration of business outcome and link to organizational objectives. Now what? Once completed click the SUBMIT buttons and you can convert your work into PDF for sharing or using in meetings or presentations. If you want to go back and EDIT, then click the red button at the top to make changes. Then click SUBMIT again. Save the PDF to your computer.